Trust me on this! Iphone isn't just a phone or all the tech on smartphone put together. It's a new ballpark! Like what others were mentioned! It's a mini computer (replacing the UMPC and Notebook? ), on your palm with thiner than ipod, largest screen, but good battery life of a PMP/PDA/COMPUTER phone. 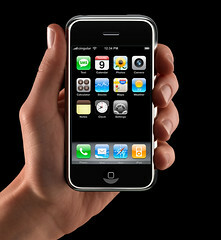 If you browse on Iphone, you will totally forget about ANY smartphone on the market, I owned several PDA, smartphone.. NOTHING comes close to iphone!